The Belgian Qwaffles (hey! That's me!) 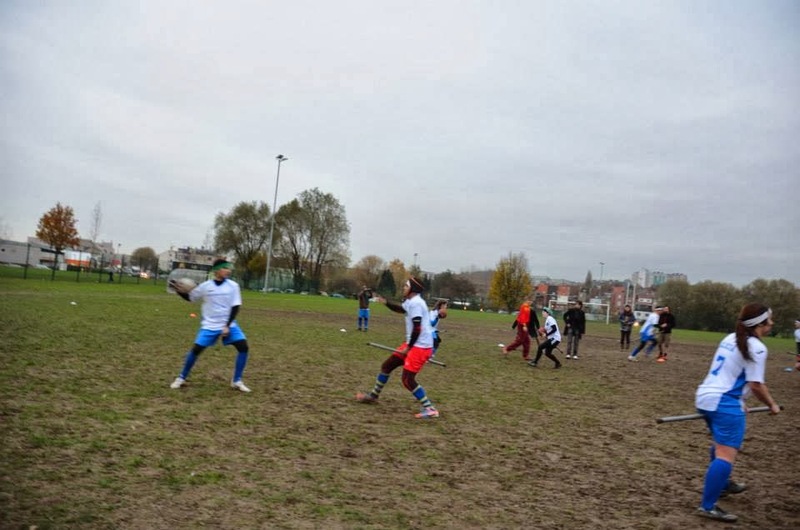 and the Belgian Beerters organized their first - and the first European tournament of the year called Brussels Muscles Invitational (Belgium really likes their puns). The tournament had 7 team: 6 of them official. Due time constraints, having 1 pitch, and an annoying amount of 7 teams, the tournament was a double elimination bracket play. This meaning losing the first time, is going into the Losers Bracket; winning: advancing in the Winners Bracket. Losing in the Losers Bracket meant elimination. Winning into the Losers Bracket was advancing. The winner of the Winners Bracket played in the finals to the winner of the Losers Bracket. 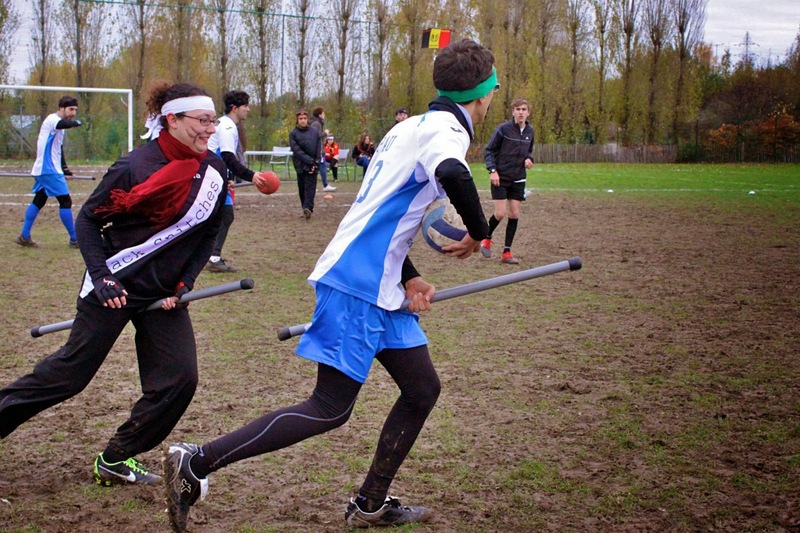 Because there were 7 teams, Toulouse Quidditch advanced to round 2 automatically. The tournament should have started at 10 am, but due some problems with the accommodation, the tournament only started around 11.15am. 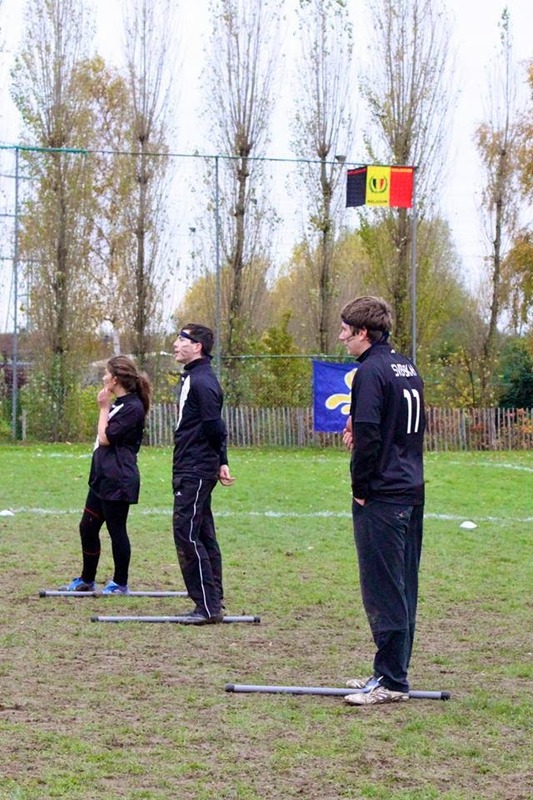 The first game was the 2nd Belgian team versus the almighty Paris Frog. Nobody really thought the Belgian Beerters were going to defeat the Frogs. That didn't happen either. 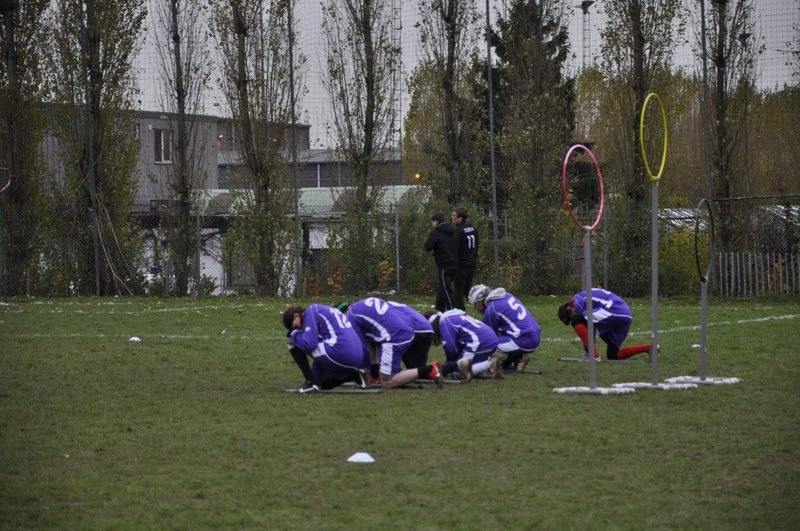 After 19 minutes, Frogs finally caught the snitch when they were already winning with 0-110. The final score: 0-140*. The Beerters never played a game before, and some of the players (actually a lot of players) never played before. There was some talent, but the Frogs were still better. Belgian Beerters advanced to the Losers Bracket, but because they were into the top of the Winners Bracket in the first game, they got into the 2nd round of the Losers Bracket. 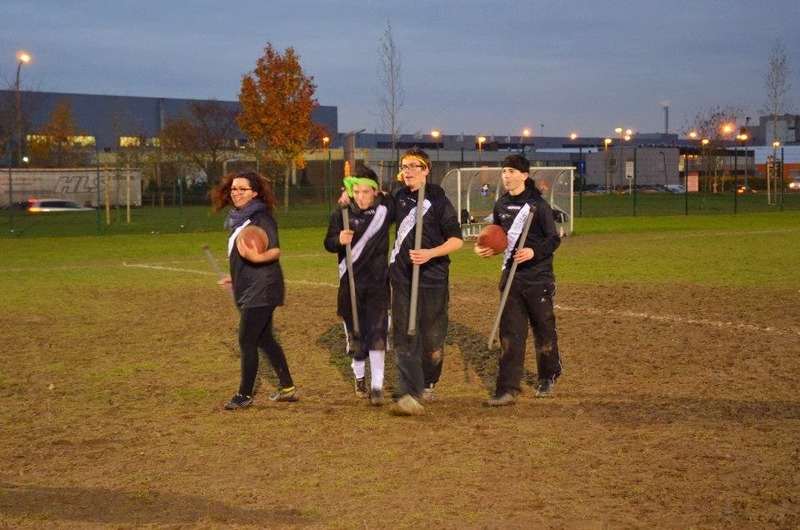 Lille Black Snitches and Barcelona Eagles played the 2nd game in Round 1. Eagles, all the way from Spain, never played a game before, and were definitely not used to the "bad" weather and the muddy underground. Nobody really knew who was going to win this game, so we just had to watch. Barcelona took a good start with some very good passing and keeping the bludger supremacy. The score was 20-50 till the Black Snitches caught the snitch. None of the teams were keeping scores, so Lille just jumped on the field, thinking they had won. They didn't win yet. The score of the regulation time was 50* - 50. So they got in Overtime. Barcelona scored in the first 30 seconds of OT again, and after 40 seconds the seeker of the Eagles caught the snitch. 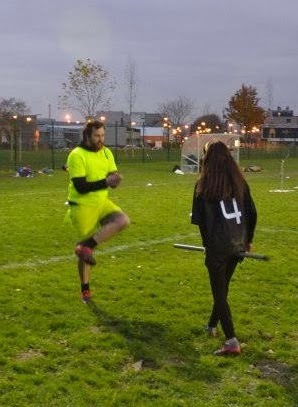 The captain of Lille was not happy with the decision of the Snitch Ref on the catch, because along him, the snitch was down (he was on hands and feet). The Snitch Referee decided he wasn't and counted the catch as good. Score of OT: 0 - 40*. Final score: 50* - 90^. Lille Black Snitches got into the first round in the Losers Bracket. Barcelona Eagles advanced. Everyone was curious what the level was of the European champion. 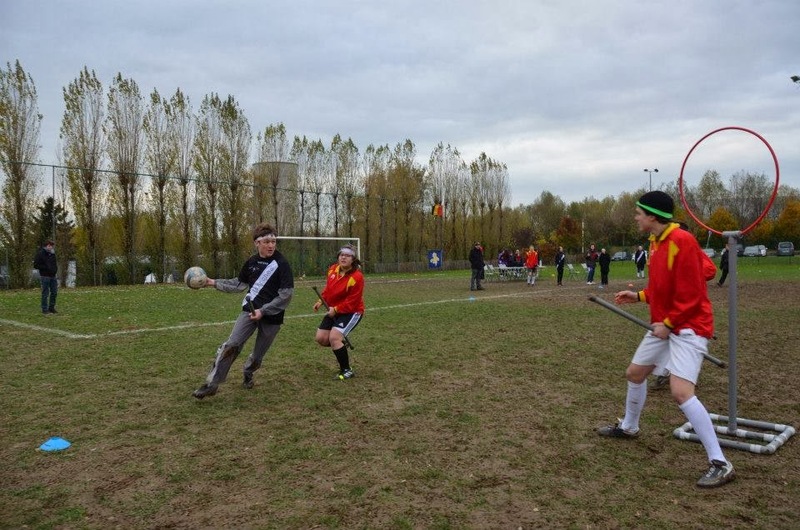 Their first game in the tournament was versus the new kid in town: the Belgian Qwaffles. 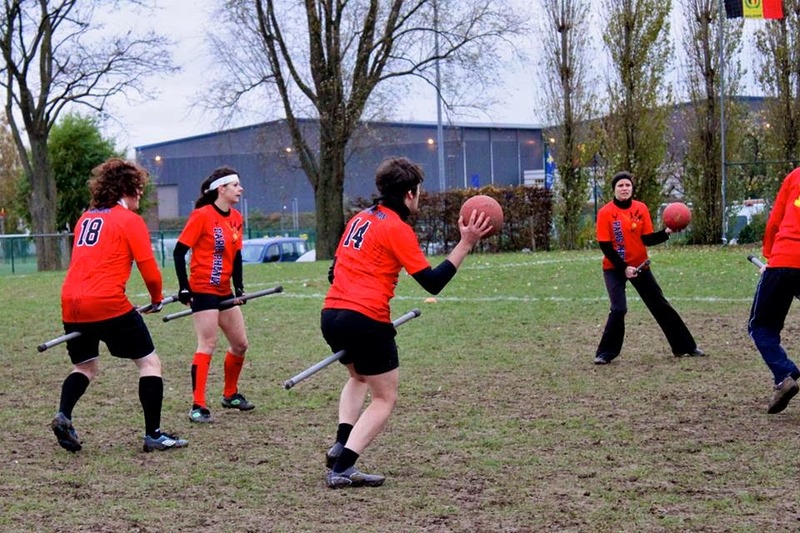 As from the game started, Phenix had a lot of problems coming through the Qwaffles' beaters. Paris did make the first 2 goals. On a counter, one of the (better) Belgian chasers got tackled and injured for the rest of the game. Also, with that tackle, the first broken broom was a fact. As that chaser was me, I can't decide who was the better team. If my team was correct, one goal was actually not a goal, because both chasers were beat. The goal was counted good. After 14 minutes, Phenix's seeker caught the snitch. Final score: 30 - 60*. 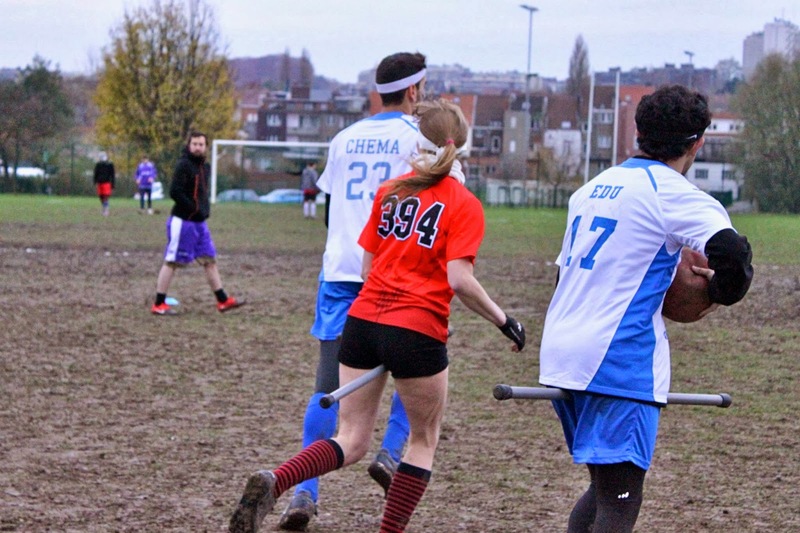 The Belgian Qwaffles got into the first round of the Losers bracket; Paris Phenix advanced. Toulouse automatically advanced into Round 2. Paris Frog advanced after defeating Belgian Beerters. Toulouse was the only team on the tournament who was unofficial, so it kinda became a Merc team, with one extra player from the Netherlands. It was no surprise to any of us that Paris Frog won the game. Final score after 13 minutes: 0 - 140*. 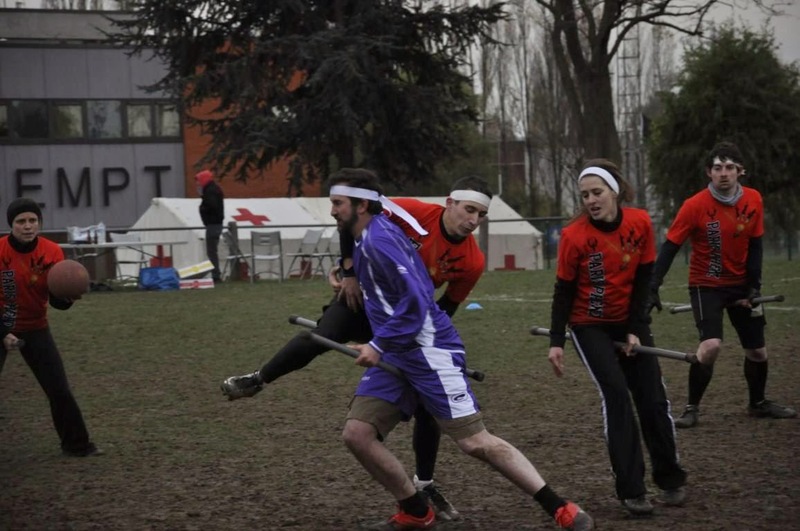 Toulouse got into the first round of the Losers bracket, Paris Frogs advanced to the Semi-Finals of the Winners Bracket. The battle of the birds. Barcelona and Paris Phenix both advanced into Round 2 after winning in Round 1. Barcelona had a close call in advancing, and everyone expected Paris Phenix winning this game. Even Barcelona Eagles. With very good passing and tactical progress, the Eagles scored the first goal. Everyone on the Eagles were surprised they scored versus the European champion. It was a very tense game, and the game kept 20-20 'till the 23th minute. Eagle's seeker caught the snitch. Nobody could believe it, not the Eagles, not Phenix: Eagles won. Eagles progressed to the Semi-Finals of the Winners Bracket. Paris Phenix, to everyone's surprise, got into the Round 2 of the Losers Bracket. The first elimination game, the loser was going to get eliminated. The Belgian Qwaffles didn't want to get eliminated as first team on their own tournament. It started good with a first goal of the Qwaffles after some good bludger dodging. But Lille came back very quickly with 2 goals while Qwaffles had problems coming through their beaters. It took a while, but Qwaffles came back to 30-20 (2 goals from the Qwaffles' ex-injured chaser). On the 9th minute, for some reason, the snitch came back on the field. The Qwaffles' beater was confused and didn't beat the Black Snitches' seeker. Lille caught the snitch. Final score: 30-50*. Lille advanced in the Losers Bracket. 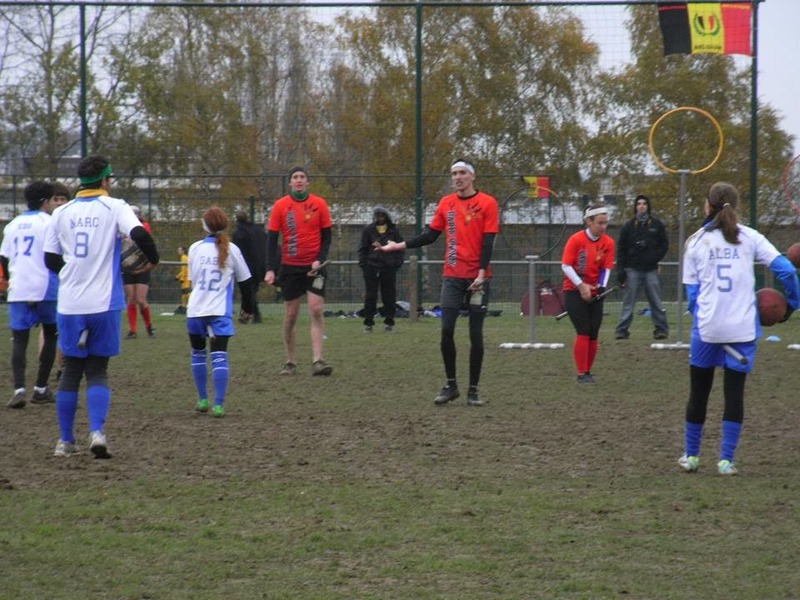 The home team, Belgian Qwaffles, were eliminated from the tournament. 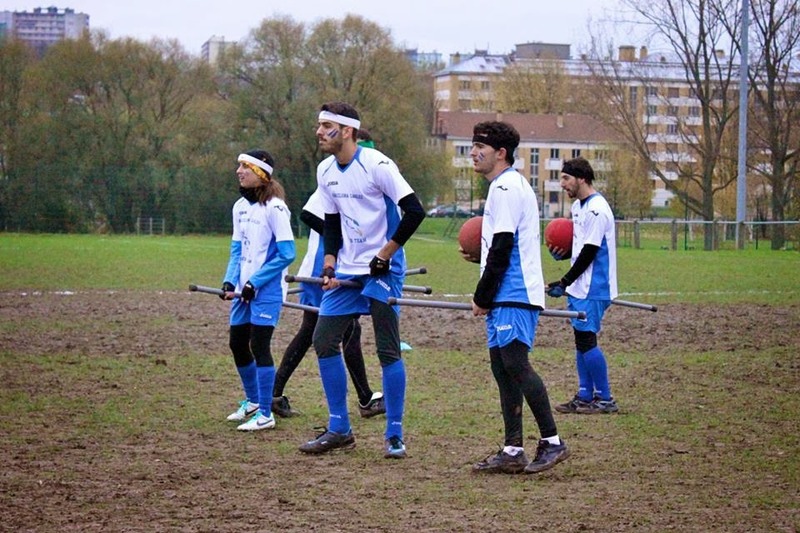 After the surprising defeat of Paris Phenix versus Barcelona Eagles, they came into the 2nd elimination game. 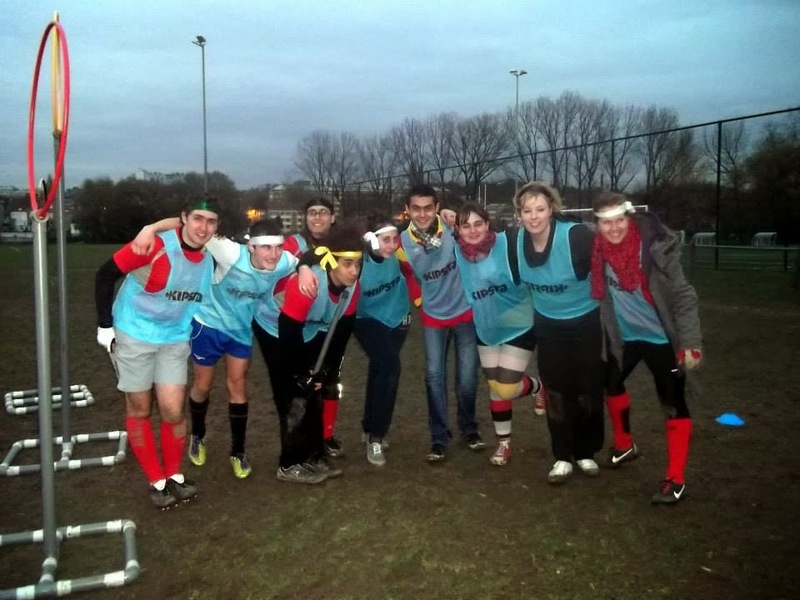 There they met the 2nd Belgian team, Belgian Beerters, who lost versus the other Parisian team, Paris Frog. It was well known to everyone that the Beerters were going to lose. So they did. Final score: 0 - 200*. At least the Beerters could play a game for 23 minutes before they were eliminated. Paris Phenix advanced to the next round into the Losers Bracket, with still a shot on the Finals. This game was weird. Nobody really showed interest in this game but Lille was just superior. how well Lille was playing. Their passing was good, the running was good, the teamwork was good. Everything was just good for them in that game. Definitely an upcoming underdog for European Regionals. Lille advanced. Toulouse was eliminated. 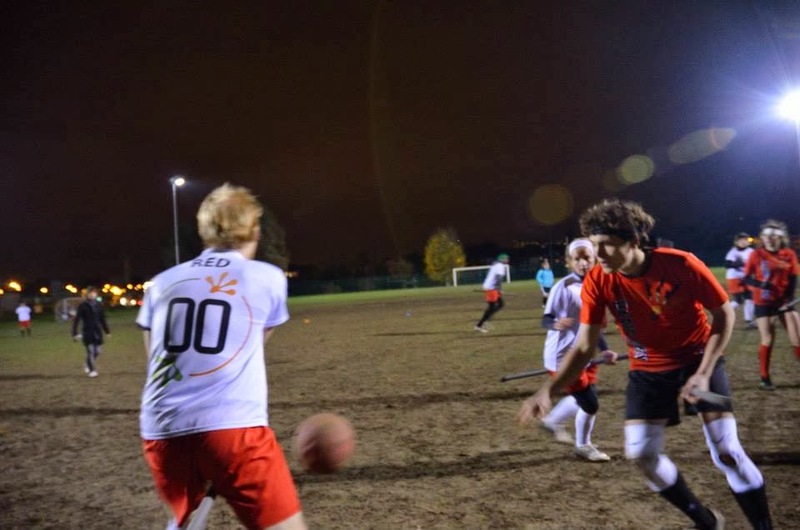 Barcelona Eagles winning versus Paris Phenix was one thing, but could they also defeat the other Parisian team? The answer is no. Paris Frog was dominating this game. 80% of the time, they were in quaffle possession. Well-timed tackles, stealing the ball, everything was good for the Frogs. The Frogs were playing aggressive, but correct. Barcelona had most of the time bludger supremacy, so it was not all too easy for the Frogs. After all, Frogs won with 4 goals and a snitch catch. Final Score: 70*-0. Nothing too bad for Barcelona Eagles, cause they advanced to the Losers Bracket. Paris Frog was sure to play the Finals. But nobody knew versus who yet. It could be Eagles, Phenix, or Black Snitches. There was something... special about this game. Everyone knew Paris Phenix was going to win this, but still.... Lille had played good before. Maybe there was going to be a surprise. But Phenix was still disappointed they had lost from the Eagles before. You could see it in their eyes. They were going to play Eagles again. The needed to go to the Finals. The game started! And Paris was the better team. Phenix's beaters hold their blugder supremacy and Paris scored very quickly without really any resistance.. Lille's chasers were not strong enough to hold off the beasts of Phenix. Lille did score twice, what's a big surprise (for Lille it was). Final Score: 20 - 80*. Lille was eliminated, Paris in course for the finals. Just Barcelona... oh.... again? Rematch of the Birds. Last time they played, Eagles won (how many times did I mention this already?). This time was different. Eagles' keeper got injured in the last game they played. That made a problem for them, cause they didn't have any chaser-substitutes anymore. So beaters had to become chasers. Paris Phenix had enough substitutes. The Eagles lost their excellent team-chasing-plays and had some problems going through the Parisian defense; they only scored 2 goals. Phenix had no problem with scoring 7 goals. The snitch was caught by Paris Phenix, meaning the game ended with a final score of 20-100*. Eagles took a beautiful, surprising 3th place on the tournament. Paris Phenix was going to play the finals versus their true rival, Paris Frog. This game has been stopped more than there was played. Not respecting the 2-minimum gender rule, multiple tackles from behind, the bad injury of one of Phenix's chasers (no penalty, just a bad fall after a totally legal action of a Frog-chaser when he made a goal), verbal offense to referees ... This was not a good game in game play or in sportsmanship. It was all so wrong, especially when it was 30-30. There was a snitch-catch from Paris Frog, but the snitch nor the snitch-ref knew it. The snitch-ref notified the head ref quite late; and on that same moment, without anyone looking to the goals, Paris Frog made a goal. The goal and the snitch catch didn't count, so the Frogs were not happy about that. The game got harder and harder and there was almost a fight on the field between 2 chasers of the teams. It was way too intense. Both of the teams were a little hard on the inexperienced referees. And then it happened... the good snitch catch... from Paris Phenix. They won. Final score: 30-60*. Paris Frog took a good 2nd place, but the first place was for Paris Phenix. Spots + Can these teams go to World Cup? The Qwaffles were not ready for this tournament yet. Give them some time and some better team spirit. They just need some better passing and tackling. We'll see what they will bring on European Regionals. I can see the Qwaffles ending in the top 6 of European Regionals, with some better luck. They were definitely not playing bad on Brussels Muscles, so I give them a chance (and I'm not only saying that cause I'm on that team). If the Qwaffles go into top 6, I don't see Beerters qualifying. I only have seen 4 good players on the Beerters, with talent and doing effort. Because the Beerters and Qwaffles can still change their roster, I see these 4 players going to the Qwaffles, and the "worst" players going to the Beerters. Sorry guys. Because Toulouse isn't an official team, and won't become one this year. Also with the playing qualities they have (that I have seen on the tournament (also... they were a Merc team... and they never played in that formation before)), I wouldn't even see them qualifying. They were good. Better than I thought. And the whole team wasn't even there. I'm pretty sure they can qualify. They have the quality. If they will is another question. They are missing that strength to break through some defense. Give them 1 extra strong chaser and the Black Snitches will win a lot of games. Also... their beaters just need to learn to keep the bludgers a little longer, cause if they are in bludger supremacy, they are mortal. 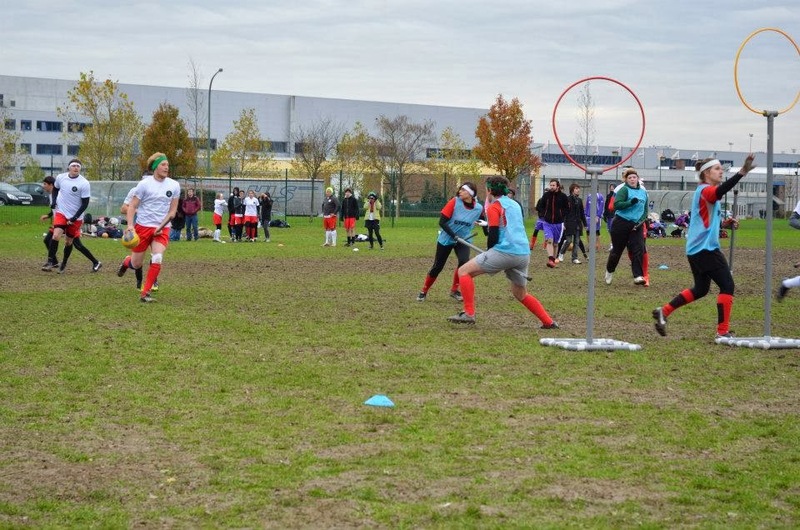 The biggest surprise of the tournament, and probably even of European Quidditch today. 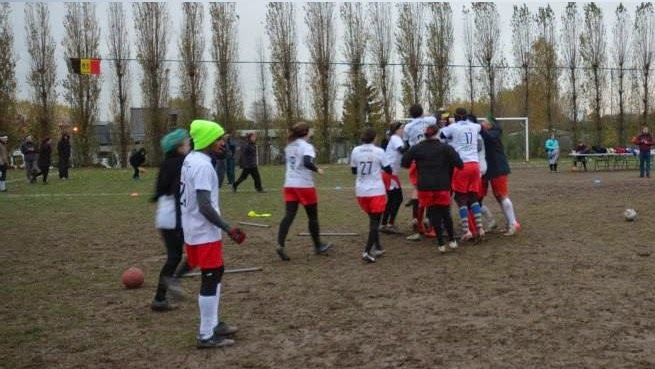 Without ever playing a game before versus another team, they just took the 3th place and defeated Paris Phenix. Their passing and teamwork was so good! They were fair, they were honest, they were good, they have the looks, they were everything what a good quidditch team needs. Give them some more substitutes and they'll take a Top 3-spot on European Regionals for sure. The Frogs (or is it Frog? It's so confusing.)... They are good team, not complaining. They just forget that they don't have to win every game. 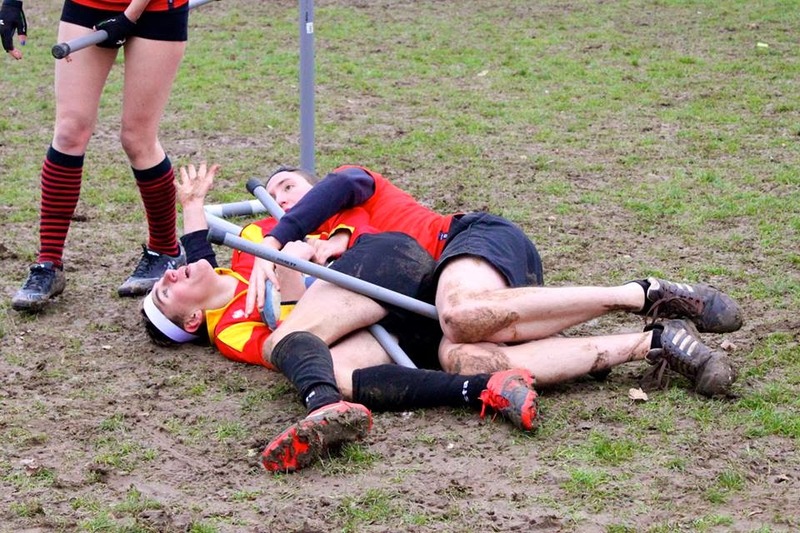 Quidditch is not the game to complain about everything. They need to respect the officials a little more (referees can make mistakes too). On quality, there's no doubt they'll go to World Cup. And if they finally translate Rulebook 7 into French, they'll know their rules even better. Can the European Champion qualify again? Yes they can! Their quality is still good, they have the winners mentality; they are ready for it. They will become Top 3 for sure. They have the strength, the passing, the scoring, the seeker. I see a strong team. They just have to learn to not start being pissed if they lose! And also a French Rulebook 7 would help them a lot. Thank you for being on the tournament everyone! 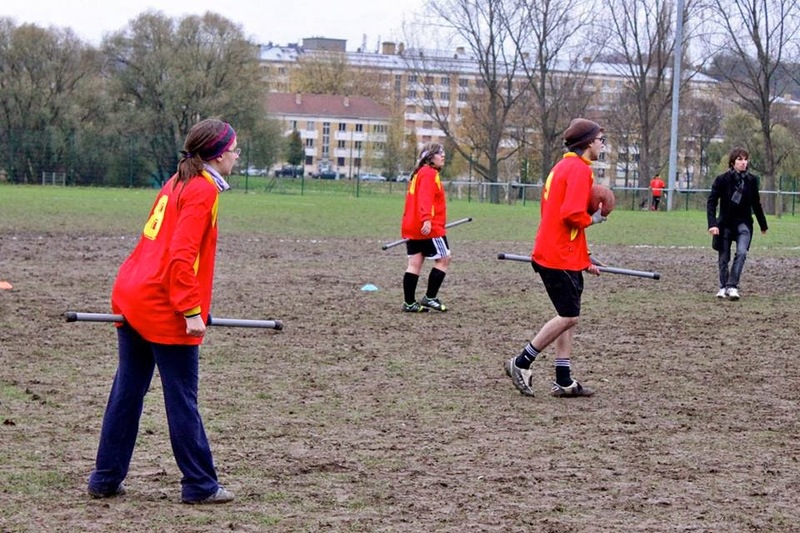 I wish you all an amazing quidditch season and I'll see you all on European Regionals! Again congratulations to every team wherever they ended. Because after all, it doesn't really matter how good you are, you're all quidkids, you're actually crazy enough to play this on a "professional" level. Just stay awesome and I wish you all the best of luck for all the upcoming tournaments (if there are) and European Regionals!